For the "thumbprint" cookies I used homemade guava, star fruit and liliko'i jams. Banana would be great...but I did not have any open. I just can't help myself. I need to be making some sort of dessert all the time. 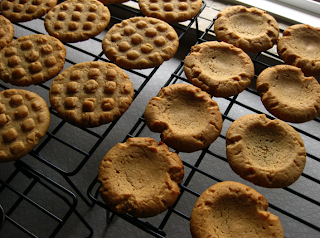 I've kinda had my fill with the fruit inspired cheesecakes, muffins and such so I thought I would try some peanut butter cookies. But I could not just make one kind...OH NO... that would be too simple. So I made some "thumbprint" cookies to later add some...yes, you guessed it... fruit jam. See, there is no getting away from using fruit. As with anything I make, rather than making a single batch, I made a double... which yielded 90 cookies. You can freeze these and pull a few out each day. I call it portion control. I'm not going to attach a recipe here. Find one you like. I used the one from BETTY CROCKER'S COOKY BOOK which is perfect. I am going to try to make my own modified version now that I have the basic recipe. And just wait.. I already have in mind what I am going to do... and cannot wait until these are gone so I can tryit out. I may loose sleep over it! EAT FASTER JOHN! Add dry to wet when all wet has been creamed well. Chill dough for 30 minutes. Roll dough into 1 1/2' balls. 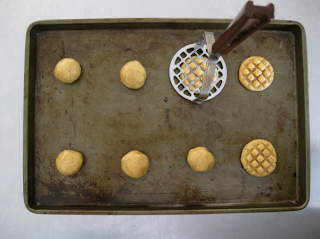 Place no more than 8 on a cookie sheet. Press with a fork, or as I did with a potato masher. Making sure to keep the utensil floured after each pressing. 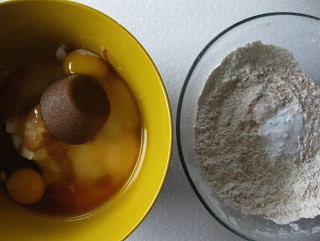 Keep dough in fridge between batches. 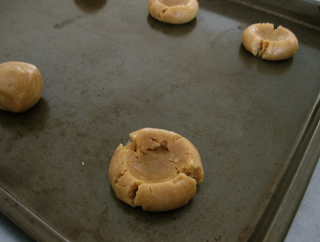 Bake at 350 for 10-11 minutes for a chewy cookie... which is how I like them. John prefers them on the crisper side so I baked his half at 12-13 minutes. The cookies will spread out to about 3" across. For the "thumbprint" version... I didn't use my thumb. I used a melon baller to make the indent. 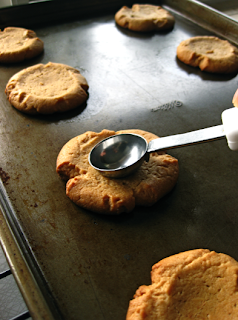 Make sure to keep the utensil well floured. 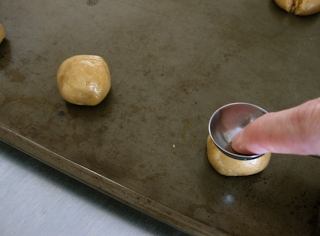 Before the cookies cool, take the melon baller and and lightly press the centers down in a circular motion. 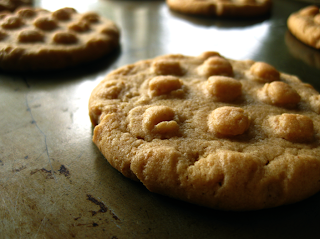 As the cookies bake, the centers tend to rise back up. Doing this will allow for more jam in the center. Cool on wire rack. 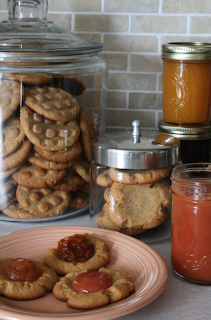 Fill the "thumbprint" cookies with your favorite jam. But seriously, what a great idea Conn.
By the way, do you style your pictures for this blog? Or, is the randomness of your life actually this fabulous? Aloha James... I was salivating too while writing the post SO OF COURSE I HAD TO STAEL ONE FROM THE JAR! As for the styling... it's a little of both. Styled a bit... but pretty much what you see is what you get. Cropping always makes things look better than real life. It's like when you are watching the sunset and you think how beautiful it is. So you take a photo. And it looks so much better in the photo because you have captured the best part without all the peripheral elements. i took a step further and melted semi-sweet chocolate chips. no fancy prep, just dip and eat! Dammit, all I have here is a package of Oreos. The Betty Crocker Cook Book is my bible. Bible of butter. well even i can't resist the occasional oreo.